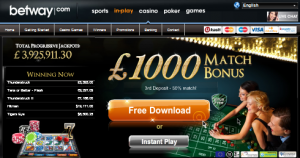 Betway offers up a $1000 welcome bonus that will appeal to players with all types of budgets. This is because it is a three-step system, consisting of a 100%, 25% and 50% match bonus. So, players with smaller bankrolls can take full advantage of the first bonus while high rollers can claim the full $1000. This tiered welcome bonus system is becoming increasingly popular in the online gambling market, as operators understand that first deposit bonuses should appeal to a wide range of players. Aside from the welcome bonus, Betway actually does not offer players any other promotions. If you’re interested in sportsbetting, that where most of the promotions take place. On occasion, Betway does offer bonus promotions, so players should keep an eye on the ‘promotions’ page to know when these become available. Betway’s online casino is powered by Microgaming, so you’re in for a high-quality online gambling experience regardless of which games you choose to play. With impressive graphics and smooth animations, Betway’s online casino games are top-of-the-line. There are over 200 slots games available at Betway online casino, in addition to video poker, roulette and blackjack. While these are the only table games available, there are plenty of variations on each, so experienced gamblers have a lot of choice. So, while Betway is primarily an online sportsbetting website, it is also a great place to play general online casino games as well. Betway is also hooked up to Microgaming’s generous progressive jackpot network. Of 17 Microgaming-powered progressive jackpots, Betway offers 9 of them, including Mega Moolah, King Cashalot and WowPot. The jackpots are just as generous as they are at Microgaming’s larger online gambling websites. Recently, one lucky Betway player walked away with a $1.2 million progressive prize, and jackpots worth tens of thousands of dollars are awarded on a regular basis. Additionally, progressive jackpots are not only limited to online slots. Jackpot Deuces is a highly popular video poker progressive, which offers jackpots in excess of $60 000. When it comes to customer service at Betway online casino, you can rest assured that you are getting the best protection in the gaming market. Betway is certified by eCOGRA, an authority dedicated to ensuring that players at online casinos are protected against dangers such as hackers, scams and viruses. With this accreditation, Betway ensures that players are fully protected when they log into the online casino portion of the website. Banking at Betway is also safe, secure and convenient. For players in New Zealand, there are 19 banking options available, including Visa, MasterCard, Entropay, NeTeller and Skrill. All of the banking options available offer immediate transactions, aside from bank transfers which can take up to 5 days. However, with such a wide range of online banking services available, it is unlikely that you will have to use the bank transfer option. Betway isn’t just for online sportsbetting. 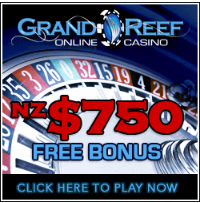 It is a great website for online casino games, perfect for slots fans, experience gamblers and even punters that are looking for a chance of pace. The online casino at Betway prides itself on offering convenient and efficient service in the gambling market, ensuring that players can easily access their favourite online casino games for the chance to win generous cash prizes. As an added bonus, your Betway casino account is hooked up to your Betway sportsbetting account so you can mix and match your online gaming experience.